The European Space Agency's Proba-2 satellite captured this view of the total solar eclipse of March 20, 2015. Two years from today, on Aug. 21, 2017, North Americans will get an opportunity to observe nature's greatest sky show. Picture this: The day starts off bright and sunny. Then, a bit later, you begin to notice that, although it is still sunny, the day doesn't seem quite so bright. And still a little while later, it almost seems like some big storm is brewing. Then, suddenly, and without any warning, the midsummer day turns strangely dark. Then, just as suddenly, the sky brightens up. The stars disappear, birds and animals awaken, and the sun returns. What you have just witnessed is a total eclipse of the sun. This total solar eclipse of 2017 will be the first time in nearly four decades that such an event will be visible so close to home. "Close," of course, is a relative term. But for most Americans, this spectacular phenomenon will occur literally in their own backyards. The track traced by the moon's umbra can run for many thousands of miles, but it's also very narrow — at most, about 167 miles (268 kilometers) wide. For this reason, it has been calculated that, on average, a total eclipse of the sun is visible from the same spot on Earth only once in about every 375 years. In recent years, for instance, assiduous eclipse chasers had to travel to remote locations such as Ellesmere Island in Nunavut, Canada (2008), Easter Island (2010) or the Norwegian archipelago of Svalbard (2015). Map showing the path of totality across the United States for the total solar eclipse of Aug. 21, 2017. But Aug. 21, 2017, will mark the first time this century, and the first time since 1979, that a total solar eclipse will cross the contiguous (lower 48) United States (Alaska had its turn in 1990; Hawaii in 1991). And for the very first time, the shadow track — better known as the "path of totality" — will sweep only over the United States and no other country, leading some people to refer to this upcoming event as "The Great American Eclipse." Not since 1970 has there been an opportunity to see a total solar eclipse in such easily accessible and widespread areas of the United States. There have been a couple of limited opportunities, such as in 1972 (Quebec and the adjacent Canadian Maritime Provinces) and 1979 (the Pacific Northwest and Northern Plains), but the areas of visibility were either limited or somewhat difficult to reach. And not until April 2024 will there be another opportunity comparable to that offered on Aug. 21, 2017. One end of the continent to the other! Also, for the first time since 1918, the moon's dark shadow will sweep across the U.S. from coast to coast. At local sunrise on this third Monday in August, the shadow of the moon will first touch the Earth at a point in the North Pacific Ocean, about 1,500 miles (2,414 km) northwest of the Hawaiian Islands. Then, for 3 hours and 13 minutes, the shadow will race first east-northeast, then east and finally southeast, along the way darkening a narrow strip of the North American continent. Initially, the shadow will traverse nothing but wide-open ocean for 28 minutes. Finally, it will make landfall along the coast of Oregon at the community of Lincoln Beach. Traversing the United States, the total eclipse will be visible within a path of darkness stretching from Oregon and then on through Idaho, Wyoming, Nebraska, Kansas, Missouri, Illinois, Kentucky, Tennessee, Georgia, North Carolina and, finally, South Carolina. The path will average 67 miles (108 km) in width, but while moving through western Kentucky, about 12 miles (19 km) northwest of the town of Hopkinsville, the shadow's size will widen to a maximum of 71 miles (114 km). Right at the Oregon coastline, totality lasts 1 minute and 59 seconds, as the shadow will be traveling at more than three times the speed of sound (2,400 mph, or 3,900 km/h). Heading southeast along the center line, the totality time slowly lengthens, reaching a maximum of 2 minutes and 40.3 seconds at a spot in southern Illinois about a dozen miles (about 20 km) southeast of the city of Carbondale. 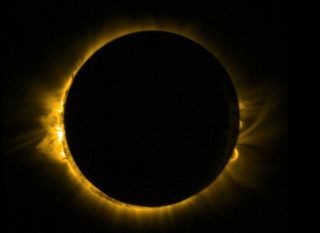 The shadow — which, at this point, has slowed to 1,450 mph (2,330 km/h) — then begins to increase in speed, and the duration of totality subsequently begins to diminish. Indeed, when it arrives at the South Carolina coastline, the duration of totality will have dropped to 2 minutes and 34 seconds. The shadow then exits out to sea, finally leaving the Earth 75 minutes later at local sunset in the North Atlantic Ocean, 390 miles (627 km) to the southwest of the island nation of Cape Verde. Notable cities inside the totality path include Idaho Falls, Idaho; Casper, Wyoming; Grand Island, Nebraska; Lincoln, Nebraska; Columbia, Missouri; Nashville, Tennessee; Columbia, South Carolina; and Charleston, South Carolina. The metropolitan areas of Kansas City, Missouri, and St. Louis are right on the edge of the totality path. Warning: Never stare directly at the sun, either with your unaided eye or through telescopes and binoculars, without proper protection. Serious eye damage can occur. Solar eclipse observers and astronomers use special filters to safely observe the sun. Weather experts have performed studies to help observers pick the best opportunity for cloudless skies in and near the path of totality on Aug. 21, 2017. The best chances for a clear look appear to be in the area running from western Oregon through Wyoming, where, on average, the odds are on the order of about 70 percent. Going farther east, the odds of clear skies gradually diminish; from Kentucky to the Atlantic coast, it's just about a coin toss for favorable weather: just 50-50. Starting the week before, the National Weather Service will provide increasingly reliable forecasts, which will enable people to choose a location where the chances of a cloudy sky are low. Surrounding the dark umbra is the penumbra, or partial shadow. It will also be conical but much larger — nearly 6,000 miles (9,700 km) in diameter. The penumbra is simply the half shadow that lies outside every deep shadow, whether it is cast by the moon or a house. Wherever the penumbra falls, a partial eclipsewill occur. All of North America will be inside the penumbra, causing a rather large partial eclipse for much of the U.S. and portions of southwest Canada. The closer you station yourself to the path of totality, the greater the magnitude of the partial eclipse will be. When watching the partial phases, observers should take precautions while viewing the still blindingly bright sun. A number of large cities will lie just outside the totality zone and will see the sun cut down to an exceedingly thin sliver of light. These include Portland, Oregon; Omaha, Nebraska; Chattanooga, Tennessee; and Atlanta. From these cities, a strangely weird twilight effect will fall for a couple of minutes. But a partial solar eclipse pales in comparison to a total one, even when 99 percent of the sun's disk is obscured. The great show can only begin at the moment when the last speck of sunlight is extinguished. And only when it's in total eclipse is the sun perfectly safe to look at; only inside the totality path itself can you witness the full grandeur of the eclipse. For that reason, many people will likely journey to position themselves within the path. Without a doubt, the "All American Eclipse" will be one of the big news stories of 2017. The major news networks will certainly deploy teams of cameras and reporters along the totality path and will follow the moon's umbra during its 90-minute sweep across the contiguous United States. Media coverage — at least for this one day — could be reminiscent of the coverage accompanying the first flights of the space shuttle. In short, the third Monday in August 2017 will be an amazing day. Mark your calendars! Editor's note: If you have a skywatching photo that you'd like to share for a possible story or image gallery, send images and comments in to Space.com at spacephotos@space.com. Joe Rao serves as an instructor and guest lecturer at New York's Hayden Planetarium. He writes about astronomy for Natural History magazine, the Farmer's Almanac and other publications, and he is also an on-camera meteorologist for News 12 Westchester, New York.Follow us @Spacedotcom, Facebook and Google+. Original article on Space.com.